The Mississippi River knows no neighborhood bounds. It is a shared resource connecting our community to the rest of the world. It is the ideal space for intergenerational, multidisciplinary programming. Reflecting that sentiment, Great River Passage offers a diverse portfolio of richly partnered programs and events that welcome all to deepen relationships with each other and Saint Paul’s wilderness. As Great River Passage Fellow I am honored to both build and participate in programs with our partners and community. Reflecting on summer 2018, I share the following highlights. 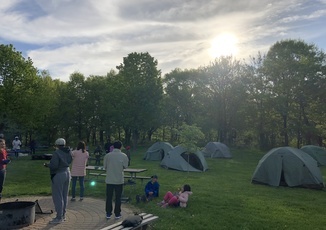 In collaboration with Recreation Services and Wilderness Inquiry, we hosted 22 families (91 people) for overnights at the river. The programing and gear are free in order to welcome families who are new to camping. The season began in February with our first-ever Winter Camp at Jimmy Lee Recreation Center. Families tried out camping indoors and could sign up for one of four summer trips at the river in Fort Snelling State Park, culminating in a multi-day paddle and camp trip on the Saint Croix River. For us, family is an expansive, inclusive term. There were aunties who brought their nephews, multigenerational groups from grandparents to grandkids, parents who brought their kids and their kids’ friends. Reflecting the beautiful diversity of Saint Paul, families came from all zip codes, representing and celebrating a range of language, race and culture. The families got to know one another over the course of the event. The shared act of roasting marshmallows over a fire, fighting off mosquitos, cooking meals, paddling canoes, and sleeping outdoors in tents transformed strangers into a community in under 24 hours. Together with Recreation Service’s Summer Blast program, we hosted field trips to the river at Crosby Farm Park with 135 youth attending from nine different recreation centers. There, the groups were engaged in observation, exploration and play. We worked with whatever that day presented. 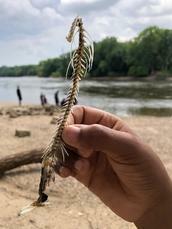 One day, we chased 100,000 baby frogs through the forest; on another we found poop from six different kinds of animals; one day the river washed ashore all the elements to make a fishing pole; one day we made boats from string, branches, and other found objects. Facilitating the trips, I was reminded that the river is a very powerful and engaging teacher. The lesson plan for working outdoors requires two simple elements – get the kids to the river’s edge and help them follow their curiosity. The beloved goats of Saint Paul returned this summer for ongoing grazing projects to control invasive buckthorn at Crosby Farm and Indian Mounds Regional Park. 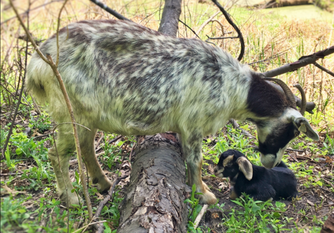 Highlights include three new baby goats born onsite at Crosby Farm Park and a stellar meet-and-greet event presented by our partner Jake from Goat Dispatch and his hungry herd of 42, complete with demonstrations from a herding dog. Read more about the project here. Speaking of buckthorn, we collaborated with Urban Roots and City Artist Aaron Dysart for a daylong workshop imagining creative ways to use buckthorn. Urban Roots youth crew removes several acres of buckthorn along the river on the East Side of Saint Paul annually. Looking at the material with artistry in mind, we imagined what we might do with this plant beyond simply mulching it. 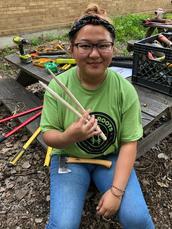 Youth interns developed sample buckthorn designs including hair sticks, sculptures, garden trellis, knitting needles, and jewelry. We look forward to further developing ideas in the coming season. Our partnership with National Park Service is now in its second season, offering the public an opportunity to paddle more than six gorgeous river miles between Hidden Falls and Harriet Island. This season we added a new river lake station at Pickerel Lake. 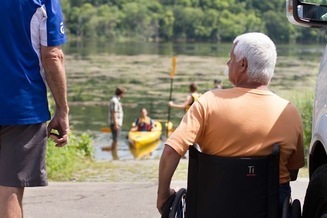 This new station features adaptive gear from Creating Abilities, providing greater access for people to connect to the river. Paddle Share remains open until October. We welcome you to get out on the river to enjoy the changing leaves. Thanks for a great summer and we welcome everyone to join us for the Saint Paul river traditions happening this fall. Stay informed with our online event calendar.